There is a scenic loop drive that we take sometimes from Glenville to Cashiers, then we take highway 64 to Highlands and down the Cullasaja Gorge road. From there we either go on to Franklin or head back home through Walnut Creek Road. 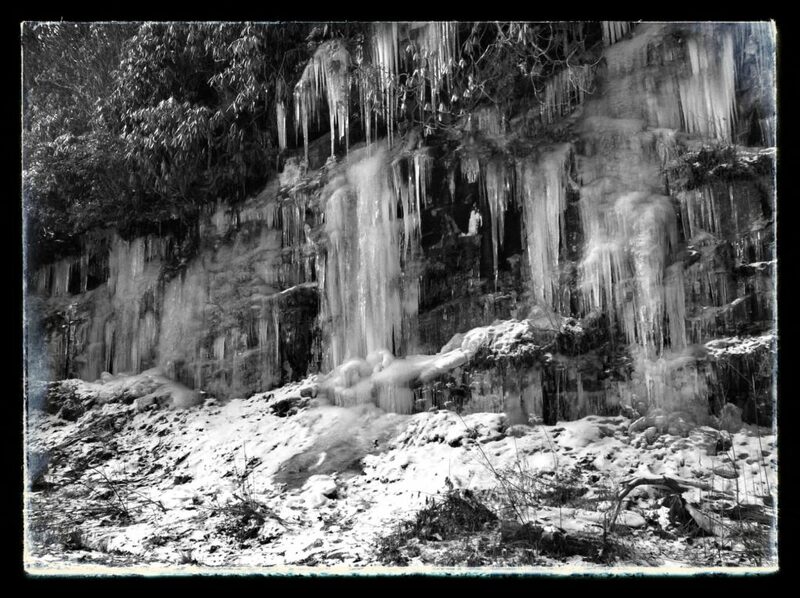 We expected the icicles and frozen North Carolina waterfalls to be spectacular with the arctic cold that has settled in for about a week. I know I have talked about icicles before, but I really do think they are a fun part of winter. And you have to start looking for something to like when the weather has gone above freezing for several days. So for me, that is icicles, and we certainly have plenty in these wet mountains. All of the rain that fell this year has made the springs very full. 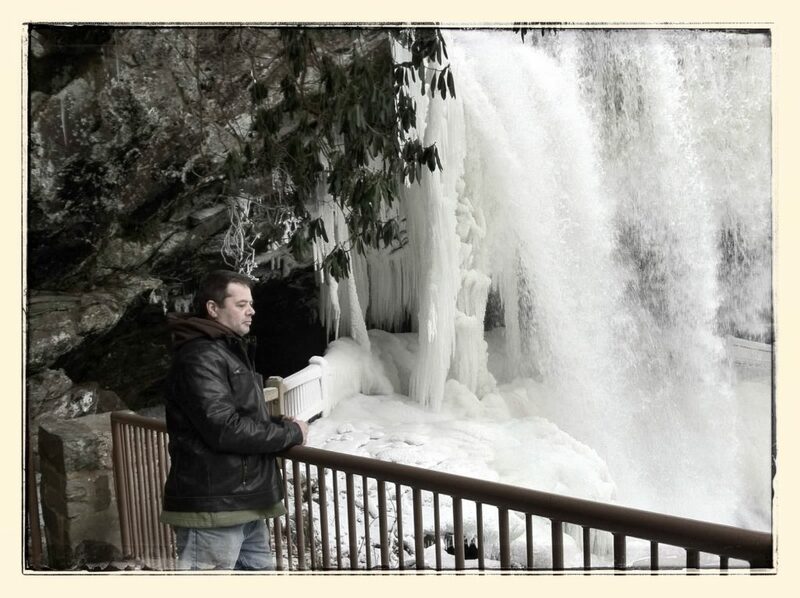 There are tons of waterfalls in North Carolina, and let me tell you, a frozen waterfall is something to see. After almost a week of freezing temperatures, the icicles were awesome. Just framing the sides of the road, they coated every rocky wall. The first North Carolina waterfall we stopped to see after Highlands was Bridal Veil Falls. It is a pretty, low-volume waterfall that is distinguished by the fact that you can drive behind it. Well, at least you can most of the year. Today it was blocked off because of the impressive amount of ice that had formed a lacy white bride’s veil. 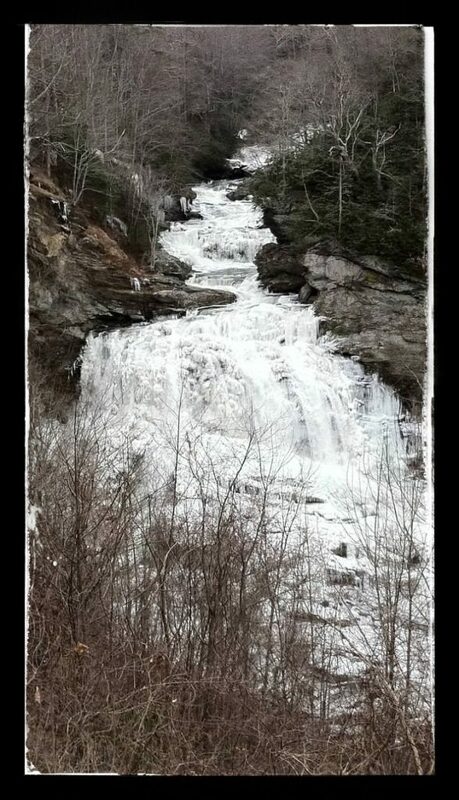 This picture give you perspective on the size of the icicles hanging down from the waterfall. The next waterfall is Dry Falls. In the summer you can walk behind the waterfall, but now it is so think with huge icicles that you cannot walk through. The mist coming off of the waterfall has coated everything below in white. Highway 64, also called the Gorge Road, continues down following the Cullasaja River that, today, is choked with ice. The Gorge Road is narrow and very curvy, which can be fun to drive or terrifying. 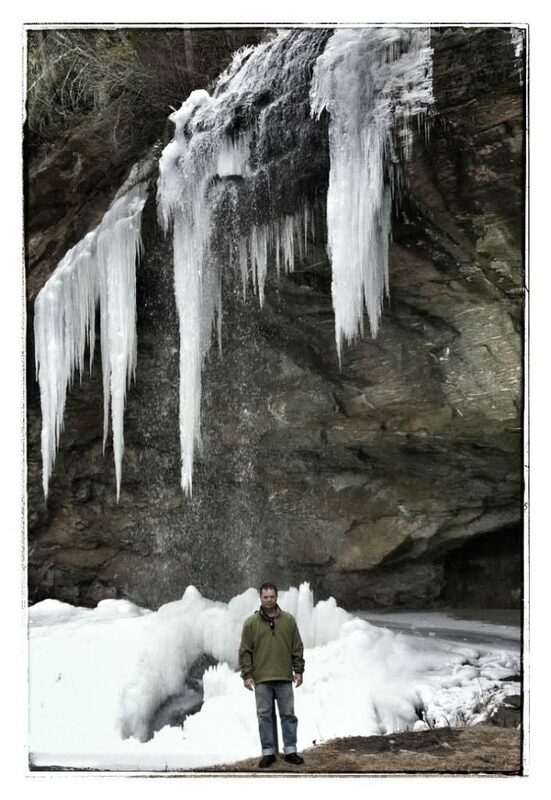 Toward the end of the gorge, we stopped at one last icy North Carolina waterfall. Callasaja Falls is the last big drop in the gorge. What a lovely drive to look at North Carolina waterfalls on a chilly winter day!